The Sunwell SF (Shallow Former) model thermoformer & pre-heater makes a variety of thin gauge food containers from a wide range of materials such as BOPS, HIPS, PET, PP and PVC. This SF model machine pulls sheet into the contact heating platen without a heat oven and chain index which saves energy and space. It also avoids sheet sagging in the oven and make the process easier. The top moving platen is driven by a servo motor, linked to a mechanical toggle system to give precise positioning and motion control. 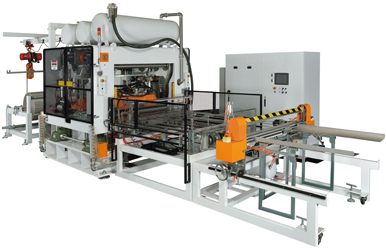 The fix bottom platen consists of four layers: the first section is the surface plate, which has thousands of tiny holes for air blow forming, the 2nd plate has flow channels for controlling the form air pressure, the 3rd plate has mount heaters for heating the sheet and the 4th plate is insulated. There are multiple control zones matching the forming mold sizes, safety guards surrounding the forming area and a safety light curtain is mounted in the entrance and exit of the forming station. The air "on/off" switches are for the zoned area of air precision control in the bottom platen. Quick tool changes make the production flexible and cost saving. The formed sheet is gripped and transferred the predetermined length by the reciprocating timing belt driven system. It could conjugate with the cross flying cutter which cuts the whole web off then accumulates into the stacker. These stacked shots can then be processed separately in an off-line trim press. A continuous on/off edge mark puncher makes a mark in the edge to identify the quantities easily for the stacks and off line production. It is also available for in-line process with a vertical trim press for mass production. SF model thermoformer make it possible to provide thin gauge products the most suitable solution for the various shallow containers production needs in the food packaging industry. Application Shallow Containers for Thin Gauge Sheet of BOPS; HIPS; PET etc.